There was no way around it, Arthur admitted to himself. He was going to need a much bigger trash bag to deal with this. It had been a spur of the moment decision, and act of passion and madness. Now, standing among all the carnage, surrounded by the destruction caused by his own hand and his hammer, there was no denying that he must have been insane to think he would ever be able to get away with it. Carefully, he peels his soaked work gloves from his hands, the material sticking and refusing to let go, Carefully he turned one glove inside out before using it to remove the second, hoping to avoid getting anything on his hands. With a sigh, he left his uncomfortable face mask in place, and did his best to look past the obscure and unnamable matter that speckled his protective goggles. He did not want to risk removing them at this point, as it would likely mean he would need to get more, and he had none left on hand. With his luck, he would drop them onto the floor and they would be unsalvageable for continued use. On top of it all, he knew that it would be stupid to create a reason to leave the room he was in, even for the most innocent reason. If he made an excuse where it caused him to have to leave the house, he knew, deep down in his gut, that it would only complicate matters. If he created a reason to leave the house, he knew he would leave a mess which would indicate to anyone what he had done, or that he would simply leave it all behind and never come back. He knew that if he left everything as it was, if he didn’t clean up meticulously, he would be caught, and would have to face the full punishment for his actions. The kind of punishment that he was almost certain would completely alter his life, more so than he had altered it when he had taken the hammer in his hands in that moment of absolute certainty. As calmly as he could, Arthur grabbed the still open bottle of water from the counter, and took a long sip. Even though it was warm, it proved to be refreshing after his exertion. It also gave him the chance to really look around and take in everything that he had done, and all the complications it had created. He should have listened when his friends told him that remodeling a bathroom was a job best left to those who knew what they were doing, and not a good project to undertake while your wife was away for the weekend. Definitely not a project to start on a Sunday. Older Japanese movies are a bit of an interest for me. As much as I love current Japanese horror movies, there is always room in my heart for the classic movies, filled with substance. A few years ago, while completing my undergraduate studies, I had the immense pleasure of partaking in an Asian film class. Each week we would meet for our 3 hour class, and settle in to watch yet another amazing film. While not all of them were right up my alley, they all got me thinking about films and their connectedness to life. We had the benefit of having each film paired up with another, which were thematically relevant (Princess Mononoke and Pom Poko, environmental cautions linked with spiritual concerns; Pulse and Ringu, technology as a means to destruction, etc.). One of my favourite pairing was the classic Ugetsu (1953, Kenji Mizoguchi), and Double Suicide ( 1969, Masahiro Shinoda). Here we saw how deviation from the right path, how favouring self over duty and responsibility, led to complete destruction. Ugestu was based upon the Ugetsu Monogatari, a series of short stories written by Ueda Akinari in 1776. Taking the tales, it created a period drama which reflected real concerns at the time, while twisting it with a sad and meaningful ghost story. I don’t want to go into too much detail, as I do go into it more in the essay below. Needless to say, this is still one of my favourite movies, and I would recommend that you watch it if you have the chance. Similarly, Double Suicide is based on a much older work, The Lovers Suicide at Amijima, a play written by Monzaemon Chikamitsu in 1721. When a director chooses to adapt a literary or theatrical piece through the medium of film there can be no question that it is done with a specific purpose in mind. This is especially true for the film adaptations of period pieces done by Kenji Mizoguchi and Masahiro Shinoda. Both directors have made bold stylistic choice; they enhance and highlight the conflicting ideas of life and death, and the concerns related to Japanese concepts of the afterlife. By doing this, Shinoda and Mizoguchi emphasize the dichotomy between order and chaos, by utilizing the common concerns and issues of ninjo and giri in the life of the everyday person during times of conflict. Both films play on the idea of familial duty versus personal desire. While both are based on prior works, their respective directors make it clear that such struggles are not limited to the time in which they were originally addressed. 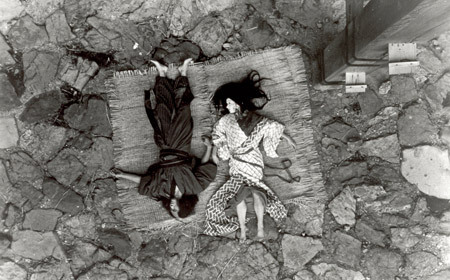 Mizoguchi and Shinoda found the core themes of both works, and uniquely approached the common issues of order and chaos through a clever juxtaposition of death, the afterlife, and supernatural elements in order to make a strong impression on a contemporary audience. Double Suicide, or Shinju Ten no Amijima (1969), is an adaptation of a popular 18th century bunraku play. Shinoda uses a heavily stylistic approach in order to draw attention to the dichotomy between order and chaos, as well as life and death. 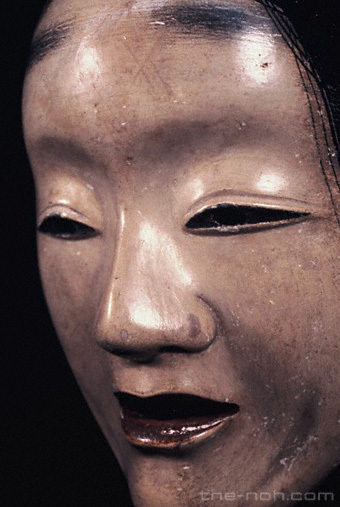 There is no outright use of the supernatural in this case; instead, Shinoda has embraced an approach based heavily on Brechtian verfremdungseffekt,1 as well as puppet theory later studied and popularized by the likes of Western theatrical theorist Gordon Craig. In Craig’s opinion, the puppet is the most articulate performer, what he calls “an echo of some noble and beautiful art of a past civilization.”2 Craig proposes that the actor should be completely replaced by the puppet, as the puppet is capable of collapsing character and being into a single entity, and thus become the perfect artistic medium.3 Shinoda goes beyond this, and instead of collapsing the characters into the puppet completely, he superimposes the identity of a puppet onto his human actors; by doing this he plays on the universally understood idea of the puppet as a symbol of death, accentuating the Brechtian alienation by using a troupe of puppeteers, or kurogo,to guide the main characters through the story. Though the cast is human and able to move of their own accord, the kurogo control the main character’s major action and decisions throughout the course of the film according to Keiko McDonald, they are meant to be a personification of fate,4 marching the character towards their death and their duty. In all of these stylistic choices, the thin line between life and death is crossed repeatedly; when the main character acts according to giri (obligation or moral duty), chaos vanishes and the kurogo do not intercede. However, when ninjo (emotion or personal desire) reigns, the kurogo are in control, leading the characters from life to death, and blurring the line between the two. Shinoda draws on this most heavily in the final moments of his adaptation, depicting his ninjo controlled characters running across a series of bridges,meant to delineate life from death, and duty from pleasure. 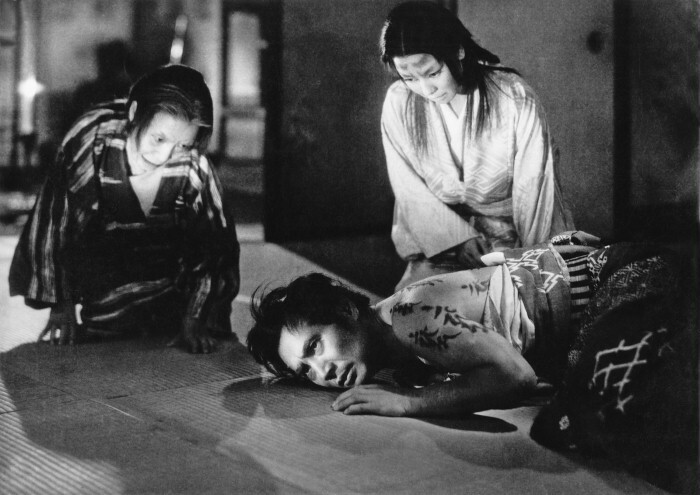 By blurring the lines between life and death, and allowing the afterlife to linger in the physical world, Mizoguchi is making a commentary on the social role of the family, and how duty and giri must be followed in order for the world to reside separate from the yurei and ninjo which arise as a result of conflict and neglected responsibility. However, both order and chaos are represented by death and the supernatural. Instead of relying on the living and the dead to delineate order from chaos, the director has put the emphasis on the manner of death and the treatment in the afterlife, thus showing the audience that while life and death commonly believed as separate, they are actually inextricably linked. In turn, order cannot exist without chaos, or else it becomes meaningless; conflict arises when one chooses to amass wealth instead of caring for personal relationships and duties; Mizoguchi stresses that the line between duty and personal desire is easy to mistake, when desire is supported with faulty reason. 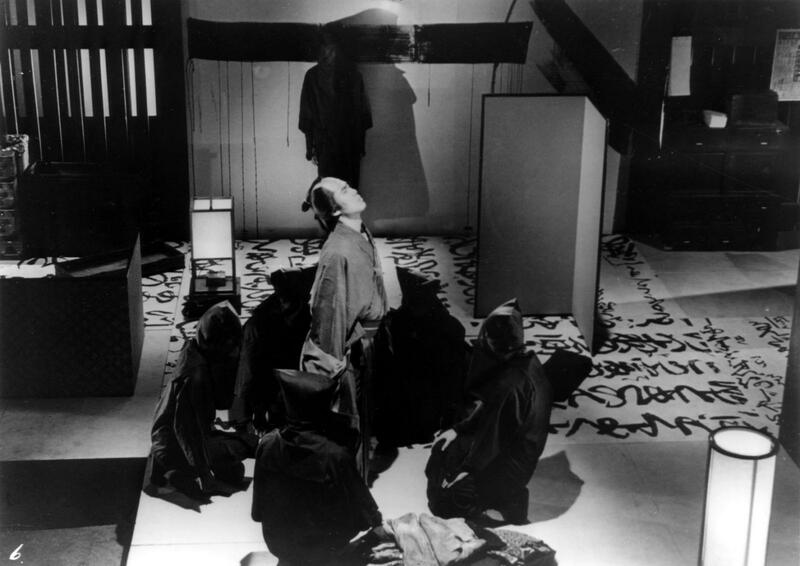 Both Shinoda and Mizoguchi strove to bring to light the common issues concerning the dichotomy of order and chaos; to do this they both adapted period pieces which addressed common social and spiritual issues, and sought to relay their meaning through the use of death, the afterlife, and the supernatural. Shinoda sought to look at the ideas of ninjo and giri in relation to death and the afterlife with his adaptable of Shunji Ten no Amijima; his work succeeded by relying on theatrical aesthetics, and his Brechtian approach in order to reinforce the idea of death as both the ultimate commitment to giri and also the complete victory of ninjo. 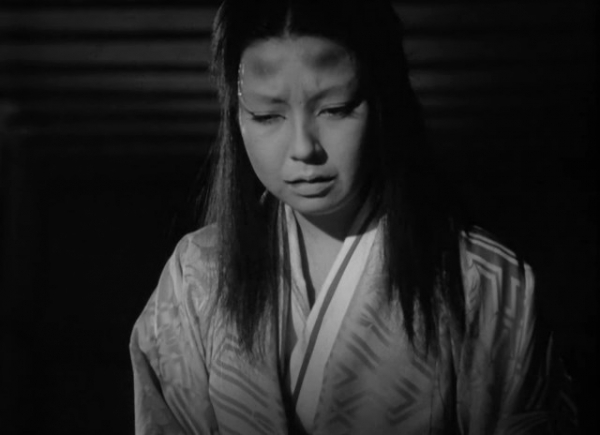 Mizoguchi used the supernatural in Ugetsu Monogatari to pursue the idea of giri and ninjo, and how it is up to the living to ensure that they fulfill their duty as family in order to ensure that order is maintained in the afterlife; without the living pursuing the path of giri, the dead are forced to remain between worlds, unable to be released from their own desires. Craig, Gordon. “The Actor and the Über-marionette.” Theatre Theory Theatre. Ed. Daniel Gerould. New York: Applause Theatre and Cinema Books, 2000. pp. 394-401. McDonald, Keiko I. “Double Suicide: Domestic Tragedies, Classical and Modern.” Japanese Classical Theatre in Japanese Classical Theatre in Films. London and Toronto: Associated University Presses, 1994. pp. 208–223. McDonald, Keiko I . “Ugetsu: Why Is It a Masterpiece?” Ugetsu: Kenji Mizoguchi, Director. New Jersey: Rutgers University Press, 1993. pp. 3–16. 1Keiko L McDonald, “Double Suicide: Domestic Tragedies, Classical and Modern”in Japanese Classical Theatre in Japanese Classical Theatre in Films (London and Toronto: Associated University Presses, 1994), 214-215. 2Gordon Craig, “The Actor and the Über-marionette.”in Theatre Theory Theatre. Ed. Daniel Gerould (New York: Applause Theatre and Cinema Books, 2000), 396. 4Keiko I. McDonald, “Double Suicide: Domestic Tragedies, Classical and Modern”in Japanese Classical Theatre in Japanese Classical Theatre in Films (London and Toronto: Associated University Presses, 1994 214-215. 5Keiko I McDonald, “Ugetsu: Why Is It a Masterpiece?” in Ugetsu: Kenji Mizoguchi, Director (New Jersey: Rutgers University Press, 1993), 9. As yet untitled. This is a variation on a theme, perhaps influences from reading a lot of paranormal fiction, and just maybe a touch of manga. The idea of the separation between life and death, between the known and the unknown, between normal and paranormal, natural and supernatural. Unsure if they even ever existed. The fades as mist after dawn. For what they can no longer reach. To leech another moment of warmth from their remembered scenes of life. Skirting on the edge of memories of those still drawing breath. Claiming them to repeat the past one more. Trying a little something different this week for Poetry Tuesday. This is a piece that i elaborated from a fragment that I found a few weeks ago when I was going through my old notebooks. As such, it does not totally fit the themes I have been going after, but I still kind of like what came out of the revisit the initial verse. The tortoise-shell cat grinned wide. Those that hide from plain sight. To his nose he touched his brown boot paw. His breath puffed out, he purrs beneath the hand. Fire brimming in its fearing eyes. Paws clasping at the carpet ground. Look all fluff and feather. Its body twisting in a dive for food. Mist green eyes follow all, his coat clean and smooth as silk. I lay my hard-won conquest down. Crossed at the old master’s feet. Creaking and bleating their lonely cries. Left with unrest in their defeat. No Sons to take them home. Shuddering in the darkness, in suspense. Not a memory of theirs remains. Yet, still these ones draw breath. Upon the soaked bloody ground, abandoned. In a field so far from home. He could hear her voice, even with his ears full of screams. Despite his efforts, the voice was no louder or clearer than what he had first begun to hear it speak. Some words echoed, and if he listened hard enough he was able to decipher some of the words, to begin to make sense what t was she was asking of him. However, most of her words were still too faint, still beyond his ability to comprehend. Sometimes he wanted to cry, to scream so long and so loud that it hurt. Until his throat was raw and bloody. All in the hopes the somehow, his own suffering would make the words come more clearly. Shakily, he ran his hands down his unkempt face, over coarse whiskers and craggy skin, leaving trails of filth in the wake of his fingers. He repeated the actions over and over, until his face was just as dirty as his hands, just as imperfect and flawed. He did it without seeming to take notice, sweat from his brown joining in to the mess. The room where he lived and did most of his work was barely lit, the merger light emanating from the crude braziers and a single lantern which hung from the lower timber rafters cast more shadows than illumination. Despite the small space, it was by no means a hovel. He strived to keep it clean especially when he had guests. They were the ones who ended up making a mess of the place, who abused his generous hospitality. It wasn’t as if he asked for much from his guests in exchange for all that he did for from. He was a humble man, and his requests were no sort of imposition. He didn’t ask them for money, or favours exchange for his generosity. He would give anything that was asked of him, his possessions were of little consequence to him, and he would offer every last piece of himself and all that was his to anyone who asked, provided they did not seek it out of personal greed. Truthfully speaking, he felt that was he asked from his guests, his only request in return for all that he could possibly give, was small and of little consequence. What he asked was so small intact, that he found it absolutely astounding the amount of times his request was refused. All his guests had to do to fully benefit from all he had to offer, was to sit quietly for a time and listen to his stories. He did admit that some of his stories could be considered boring and sad, as some were tales of miseries and sadness long passed. But those stories were just the beginning. Everything had changed for him, and for his stories, when she had started to speak to him. She was his fire, his muse, his very reason to continue living, and if only they would listen to his stories of her, they would see how inspiring and awe-inspiring she truly was. He just needed his guests to under what she meant to him. All of his guests so far seemed to get excited, elated, and hopeful when he told them about how sh had some to save him. For a brief, shining moment, they would forget about themselves, empathize with him, and he was certain that there was nothing better in the whole world than seeing how she inspired that wide-eyed glee in others, just as she had in him. He loved to watch those eyes light up, and fill with tears of pure joy when he told them, no, when he asked them to help him understand what it was she whispered into his ear now, in the dark of night when no one else was around. Her voice had long begun to fade beyond his hearing. whether this was due to age, or some other ailment, he did not know, but it burned at his very soul, and sent waves of sadness over him when he thought that one day soon, he would no longer even be able to hear her whispers. He rejoiced, danced as much as his cold bones would allow him, when his guests, like him, cried out for her to come and save them, just as she had saved him. They begged her to save them from their own suffering. It was a new miracle, each and every time, and he felt as if hope returned to him when they agreed to help him, when they dropped to their knees and begged for him to let them help. But, as with so many times in his life, hope and joy were short-lived. without fail, it seemed, each of his guests would prove to be incapable of keeping their word. Liars and thieves were prolific, and they sought to take even what little he had left in the world. So far, every one of his guests had proven incapable, unable to hear the full glory of her voice, unable to hear what she was saying with any clarity, some even proving more hard of hearing than him was. Some guests had even thrown his hospitality in his face, trying their backs on their promises and their pleas. They would lie to him about her words; he was never certain why. Some, he thought, simply were going deaf, while others like hard her voice and wanted to keep the joy and comfort all to themselves. It was always the liars, he had come to discover, that could hearth voice of his saviour clearly. Liars were never to be tolerated, they spat in both his face and her face, trying to take everything the were offered without fulfilling their promises and his request in any meaningful way. She knew who the liars were as well, and it was when they were present that he voice surged most clearly to him these days, like a bell in the fog off the sea. She advised him not to trust the liars, they were going to destroy him and steal all that he had fought so long and so hard for. They would steal her away as well, if he gave them the chance. Eventually, when the lairs and the deaf knew that he could tell they were not being truthful, they would turn violently against him, breaking hospitality. They would try to weasel out of their agreements, out of their promises. They would try to sway him with offerings, bribing him with things that he did not want, that he had no need of. Those guests always left before the sun rose the morning after they came to visit. They would go, and leave him with their mess. The screams that evening were almost completely silenced when he finally felt her presence, her voice at his ear as her words ghosted past his conscious mind. It was elusive and ephemeral, and her touch as she spoke in his ear was quickly fading, words cutting in and out, half -formed. They told him that he had been right, these guests had been unable to hear her as well, unable to take her words and bring them to the light where he wold be able to fully understand them once again. They had left a speculator mess behind as well, strewn and splashed across the floor with no regard for that fact that it would take him hours to clean. Picking up the broken ladle he had used to serve that nights fare, he returned to his task, guided ever neared to the realization that her voice might now be forever beyond his grasp. Perhaps, once he had really tidied up, tomorrow’s guest would be different, would prove to finally be able to help him discover her words, to find out what it was she was asking off him now. How best to serve his lady. Perhaps, they would finally be able to hear her as well, if he opened their ears a little further. As he began the task piling the broken bits of meat together, he ran his hand over his face, trying to clear some of the thick blood from his whiskers. The liars were always the ones who left him with the biggest mess, and even less of his hard-won sanity.